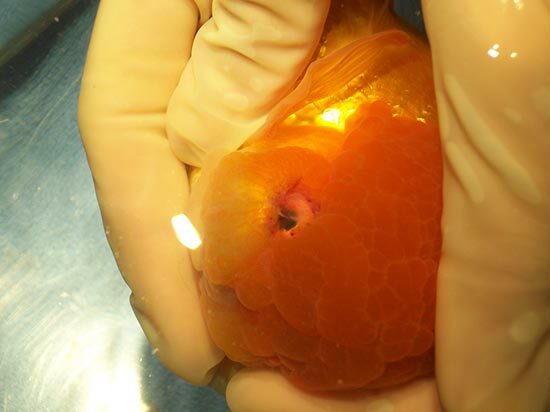 Riitta is a 2 ½ year old Oranda Goldfish who was brought to our hospital because her owner was concerned that Riitta was unable to find her food and had stopped eating. 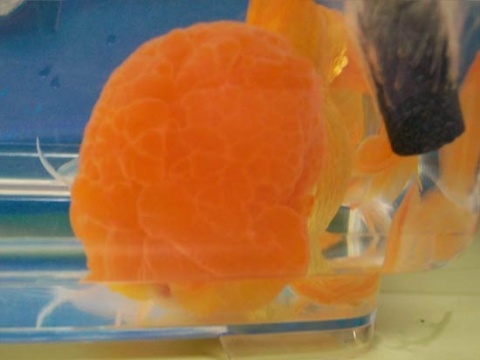 Oranda Goldfish are known for having a distinctive cap of ornamental flesh on their heads called a Wen. Riitta’s vision had become impaired when her Wen had overgrown to a point where her eyes were completely covered. Troubled for her beloved pet, Riitta’s owner resorted to feeding her by hand to maintain her health. Riitta wasn’t the only one in the surgery tank, so was Dr. Alix Wilson. The whole procedure took place under water! 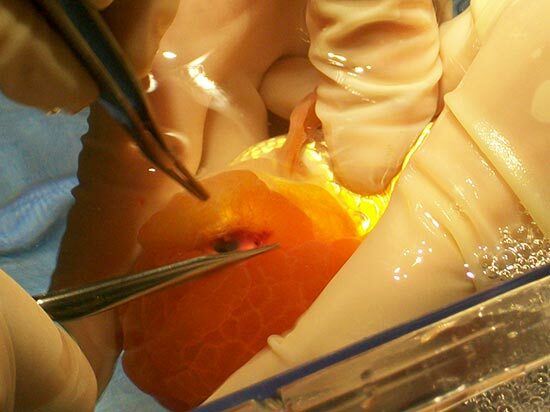 The overgrown tissue was carefully removed using specialized surgical instruments. Fortunately, this tissue is not heavily vascularized, meaning there are not many blood vessels to disrupt, and bleeding was kept to a minimum. Recovery went “swimmingly” for Riitta. Her vision has greatly improved since the surgery and she is able to find her food on her own once again. Her post-surgical care included keeping her tank water exceptionally clean, and required her owner to administer antibiotics by injecting the medication into a pea and hand feeding Riitta the prescription!